Home / How will my order be packaged? 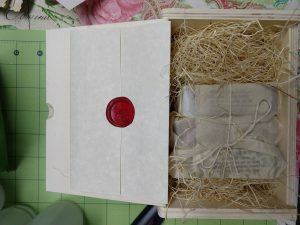 At Northanger Soapworks, we want you to feel like you are opening up a package that Jane Austen may have sent. 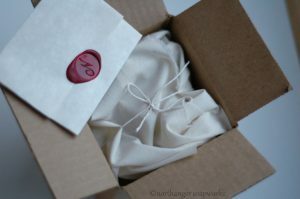 A wax-sealed letter from the shop, a bit of muslin, and an optional handwritten gift card are complimentary and we hope makes opening your package a fun experience. If you are ordering gifts for multiple people in one order and would like to purchase additional wax-sealed letters and gift cards, you may do so here. We cannot accept customization requests for muslin wrapping as it is not a gift wrap and is only a fun accent to our packaging that is used at our discretion. Tell me more about the muslin. Depending on the size of your order, muslin may be used in packing the box. For small orders of bar soap or lip balm, we like to wrap the bars in a strip of muslin, like the photo below. The above order included 4 bar soaps. For orders that include a variety of products or are too large and unwieldy for muslin, the shipping box will either have a bit of muslin on top, or we will wrap only the bar soap in muslin. For orders of any size, you can expect to see some brown kraft paper inside as cushion during transport. 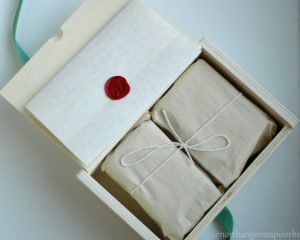 You do have the option at checkout to skip the muslin and wax-sealed note for more simple packaging. Our gift wrapping options at present consist solely of wooden gift boxes. We offer them in three sizes (Bookish Box, Soap Box, and Variety Box). Each gift box comes with a complimentary wax-sealed note and optional handwritten gift card. Excelsior or paper filler is used as needed, and soap is wrapped in tissue paper. Tell me more about the wax-sealed letter. What does it say? The contents of the letter change from time to time, and we wouldn’t want to ruin the fun of opening it by telling you what it says in advance:) We can say that it is addressed to “My Dear Friend” and includes Jane Austen references and some bar soap care tips.